What’s In The Workout Library? What Do You Get With A Library Membership? 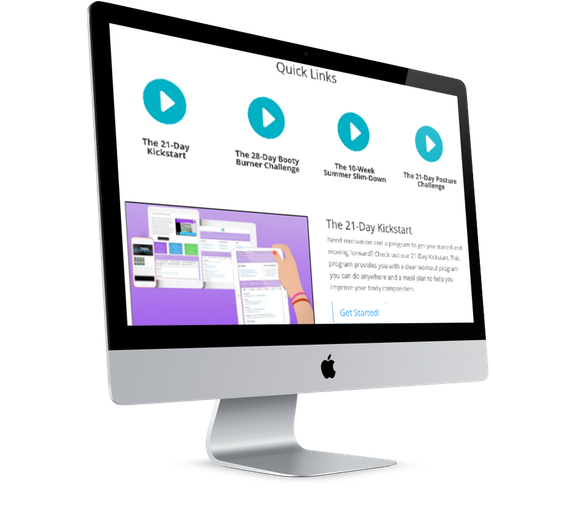 If you want 100s of workouts you can do anywhere using a variety of tools, then you’ll love our Workout Library! Whether you are looking for bodyweight workouts or workouts using unconventional equipment, we have something for you. No matter your fitness level or your goals, you’ll be able to find a workout right for you! If you are looking to achieve a specific goal, whether it is developing a stronger core or learning to use the Battle Ropes, we’ve got a Video Course for you. 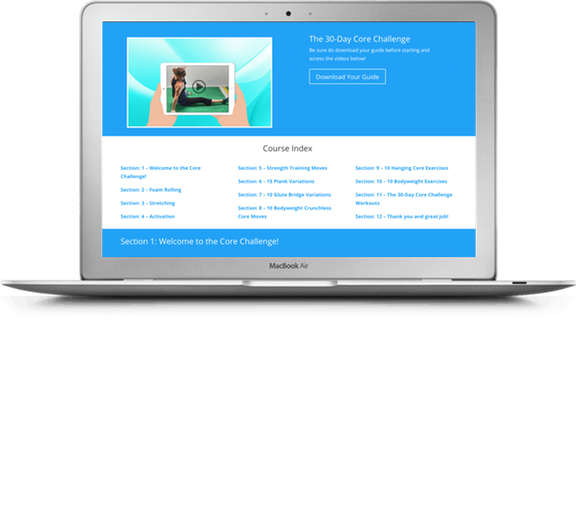 These courses provide you with video instruction to help you learn the moves as well as a PDF guide with the exercises and workouts! And COMING SOON! The 30-Day Pull Up Challenge! Interested in new workouts but need a little guidance with creating a program? Not sure how to combine workouts into a routine that gets you results? Then check out our progressions! These schedules will give you workout suggestions to help you reach specific goals. We have progressions to help you burn fat and to help you build strength. New ones are always being added as well to help you achieve great results! Sometimes it is easier to push yourself when you are following along with a video because you have a set time you have to go for and someone to follow and even try to beat. That is why you should check out our Follow Along Video Workouts. These workouts use a variety of equipment and are great whether you are looking for something full-body or just a quick burnout! If you are looking for workout programs and meal plans that you can download and use wherever, whenever, then you need to check out our e-books. If you are looking to feel and look great, a healthy diet is an important piece of the puzzle. Check out our healthy recipes for delicious, healthy meal ideas. Whether you are looking for healthy snacks, dinners or desserts, we have a variety of options. 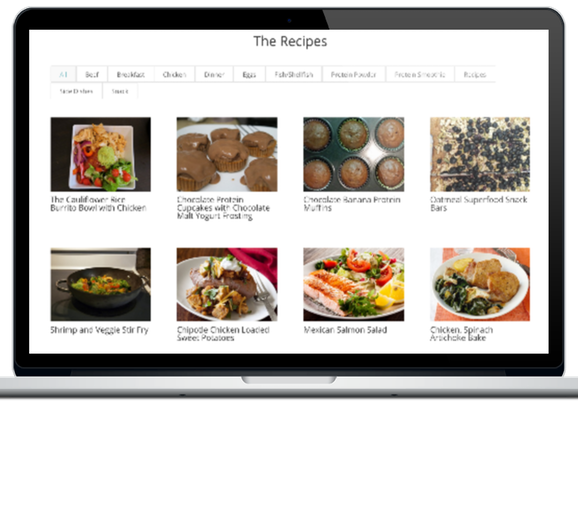 Our recipes fit a variety of diets as well, whether you want to go low carb, paleo or even follow a more traditional low-fat diet. Looking for new exercises to use in your workouts? Need help with form or ways to progress or regress movements? Then you’ll love our Exercise Library. Our Exercise Library provides you with a ton of exercises using a variety of equipment, whether you have only your own bodyweight or access to a full gym! Take a look inside our Library at what you’ll get when you join. Have you ever gone to the gym unsure of what workout to do that day? Maybe you’re even too tired to think of something so you just hop on the first piece of equipment available. Or maybe you get there and the gym is busy and all of your usual equipment is in use so you instead hop on the treadmill because you can’t come up with a new plan on the fly. Or maybe you’re traveling and don’t have access to equipment and want something you can do in your room with only your bodyweight. Or maybe you’re tired and don’t want to go to the gym so want something you can quickly do at home. For all of those reasons, we developed the Workout Library. We know you sometimes need help coming up with a workout. That sometimes you’re bored with the same old moves and routine. That sometimes you just need something on the fly when you can’t do your usual workouts. So we put together options for you to help you reach a variety of goals – whether you want to lose weight, prevent injury, build strength or simply have some options so that you can workout at home or when you travel, we’ve created a workout for you. 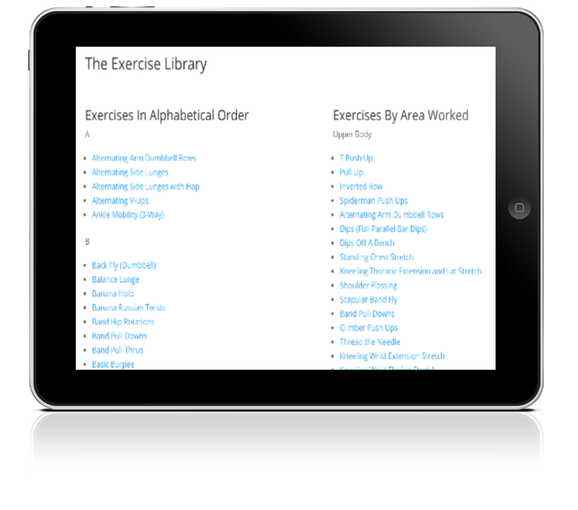 In our Elite Workout Library there are 100s of workouts with new ones added weekly. And they are all designed with a specific goal in mind. They aren’t simply exercises thrown together to be as tough as possible. They are crafted workouts that consider reps, sets, weights, goals, equipment and even fitness levels. And they include a variety of movements so that you don’t get bored repeating the same exercises over and over again. No matter where you are, how much time you have or the equipment available, our Workout Library can help you get your sweat on. We have playground workouts, gym workouts, home workouts, even travel workouts. And no matter where you go, you can access the workouts any device. With our Workout Library, you can always have 100s of workouts at your fingertips and easily sort them to find what you need! A good support network is key to achieving success. That is why we offer access to our PRIVATE online Facebook community with our Library and Community membership. 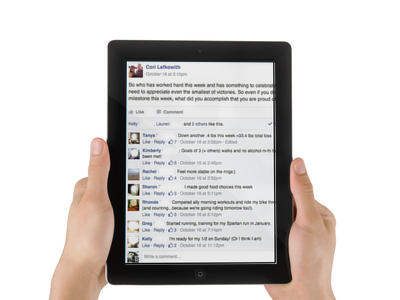 In our private Facebook Group, you will have the support of other clients also working toward their goals. Whether you need advice, motivation, recipes or anything else the group there to help! You can access our group from any device so whether you’re at home or traveling, you’ll find the support you need! 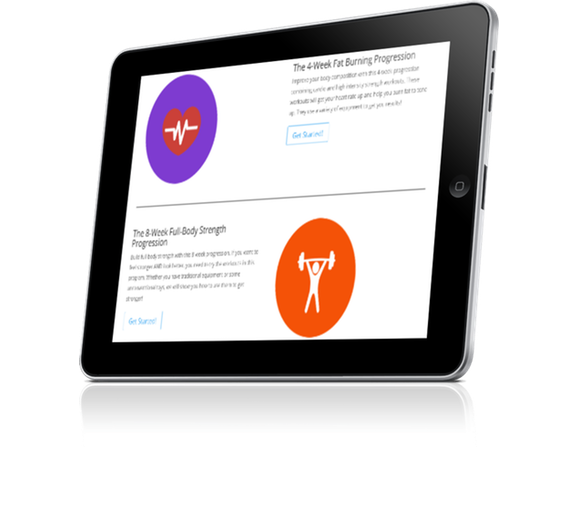 Join the Elite Workout Library with the Lifetime Access or Community Package and get healthy recipes and nutritional guidance at your fingertips! 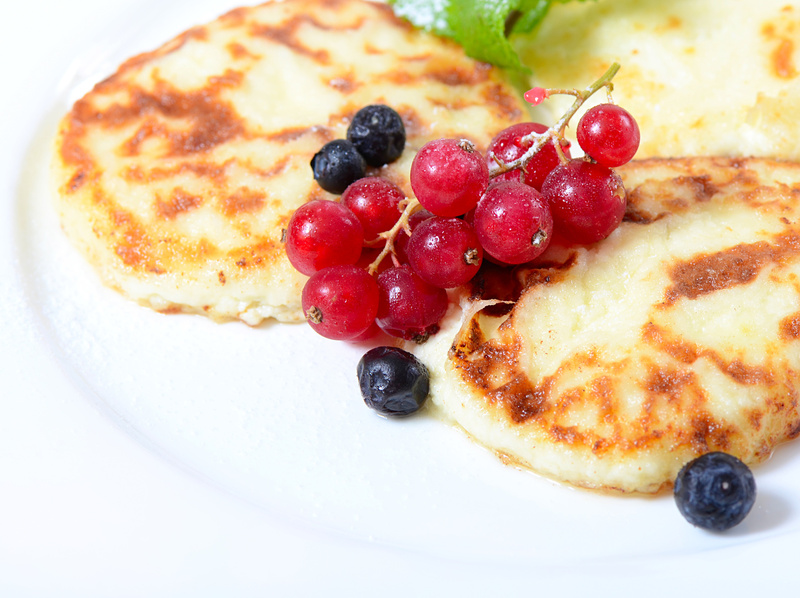 We have healthy recipes for a variety of dietary needs. Whether you are Paleo, Vegetarian, looking for low-fat or low-carb or simply something new, we have a recipe for you! And we can help you adjust your current diet to help you get better results! Check out this sample recipe.